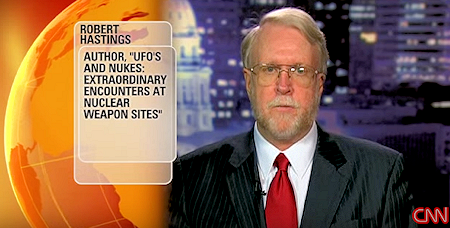 On September 27, 2010, at the National Press Club in Washington D.C., noted researcher Robert Hastings, author of UFOs and Nukes: Extraordinary Encounters at Nuclear Weapons Sites, moderated a distinguished panel of former U.S.
Air Force officers involved in UFO incidents at nuclear missile sites near Malmstrom, F.E. Warren, and Walker AFBs, as well as the nuclear weapons depot at RAF Bentwaters. The a fore mentioned former, military personnel detailed their respective, extraordinary experiences involving UFOs at nuclear weapons sites.